Tiffany Harts works with at-risk teens every day. She knows how hard their struggles can be but feels it is important to expose teens to different experiences - especially various types of professions so they can connect the present to their future. She is a strong advocate for teens and knows that she is making a difference in the lives of the teens she works with. Jasmine is a teen that decided pursuing her GED was the best way for her to prepare for her future. She is looking forward to attending Tallahassee Community College in the fall. She has overcome many obstacles to find her path and she encourages other teens not to give up. Whitney recently visited WFSU as part of a tour for teens to expose them to different career paths. She loved having the chance to be on camera, learning about what it takes to put together a television program. The hands-on experience that WFSU provided offered new career pathways that she never thought of before. Who knows, one day you may see Whitney on your local news channel. Terell Clark is a student and on the football team at Godby High School. Listen to his story. 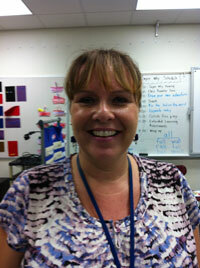 Michelle McGady is a 1st grade teacher at Bond Elementary. She also teaches Super Why! camp to prepare children for kindergarten. She speaks about the camp in this story.